Jerri here from A bushel and a hug to share a card I made with one of the new September stamps. I had a lot of fun the other day playing with this card. I used an embossing folder to create the background. I inked up the inside of the folder with some purple and a tad bit of orange Distress Stain from Tim Holtz. I did this one some watercolor paper. The technique can be found on the Emboss or Die CD. Once the paper was dry I brushed my black inked across the top of the raised portion to add even more dimension. I also rubbed some of the metallic stain on some areas. And.... because I can't leave well enough alone sometimes, I also added some white to a couple of the raised areas using a white pen. I wanted to make sure they popped against the purple background. 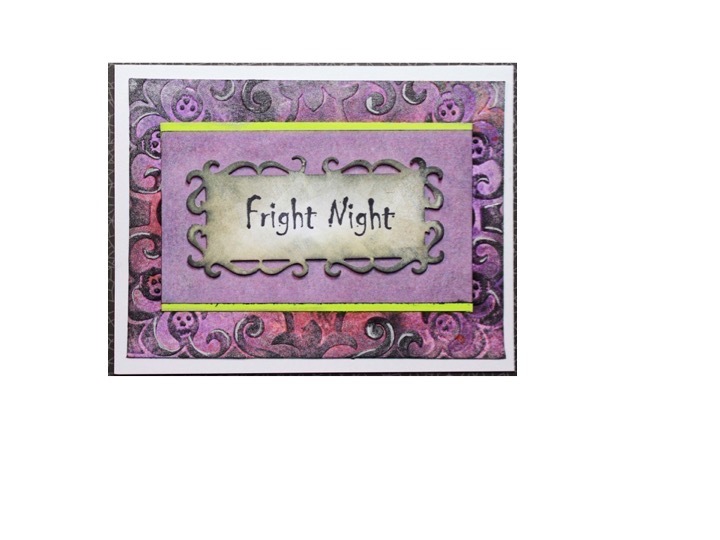 The featured stamp on this project is called Fright Night. I love this stamp and actually used it on my card last week as well. I love it so much though that I thought it could be used alone. I stamped it on a piece of white card stock and then cut it out with a Spellbinders die. Once cut out, I rubbed some of the Tim Holtz Pumice Stone and some of the Tim Holtz Black Soot along the edges. I hope you enjoyed my project today. Check out all of the awesome new stamps at the TJ Website.